The NEW FTDX3000 Transceiver is the latest addition to the Yaesu family of fine Amateur Radios, incorporating the newest down conversion and sharp edged crystal roofing filter technology. These features provide outstanding receiver performance which is a heritage of the FT-DX5000. Our new transceiver also incorporates many other new features in a compact housing. 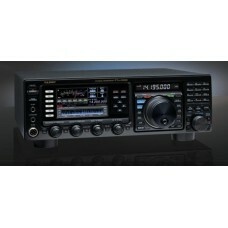 The FT DX 3000D is the newest member of the YAESU FT DX Series. It inherits the design concepts of the FT DX 9000 and FT DX 5000 transceivers that have received high praise from all over the world by those pursuing the highest ideal of Amateur HF communication equipment. The FT DX 3000D exhibits phenomenal multi-signal characteristics first demonstrated in the top-rated FT DX 5000. Using the two signal dynamic range measuring method with 10 kHz signal separation, the FT DX 3000 performance is 108.5 dB, IP3 +37 dBm. With frequency separation of only 2 kHz between the desired signal and an interfering signal, the dynamic range measures 106 dB and IP3 +33 dBm. With all its features and amazing performance, the FT DX 3000D is a terrific rig for home or for a DXpedition at a truly affordable price. With efficient dimensions of 14.4" x 4.5" x 12.3" (W x H x D) and weighing in at only 22 pounds, the FT DX 3000D is a solidly packed tranceiver ready to give very high performance on all Amateur Radio bands from 160 to 6 meters. A heavy weighted balanced brass core knob is used to give the famous Yaesu smooth flywheel operating feel to the FT DX 3000D Main Dial Knob. Each user may set his/her favorite torque feeling of the Main Dial rotation. The FT DX 3000D presents a wide view angle, high contrast LCD 4.3 inch TFT impressive full color display that provides a convenient view of the radio’s working functions. Superior operability is realized with this convenient display. It permits excellent visibility from different viewpoints. Even with the many FT DX 3000D features and functions, the TFT display makes operation of the radio easy and comfortable. The RF Front End circuit is the most important element because it ultimately determines the HF Receiver performance. Our Yaesu Engineering team has concentrated superior RF Engineering knowledge into the design of the FT DX 3000D front end. The powerful narrow bandwidth crystal roofing filter enhances the receiver multi-signal characteristics. 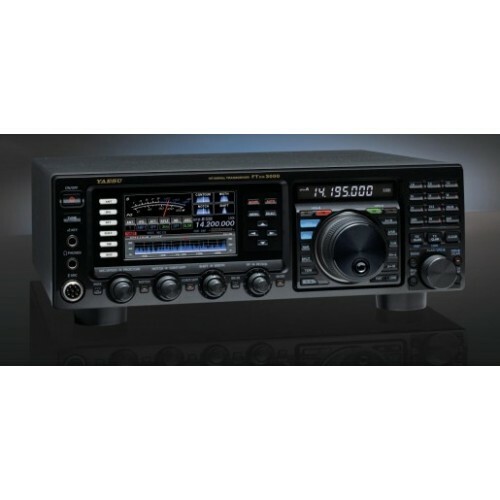 The FT DX 3000D "Down Conversion" receiver construction is similar to the FT DX 5000. The first IF frequency is 9 MHz. This makes possible narrow bandwidth crystal roofing filters (300 Hz, 600 Hz or 3 kHz) with a sharp shape factor that creates amazing multi-signal receiving performance. The powerful narrow bandwidth crystal roofing filter enhances the receiver multi-signal characteristics. Effective QRM rejection is achieved from the FT DX 3000D IF DSP. The 32-bit high speed floating decimal point DSP, TMS320C6727B (maximum 2800 MIPS/ 2100 MFLOPS) made by Texas Instruments, is used for the IF section of the FT DX 3000D. The signal is processed with the high speed 300 MHz clock frequency. In the FT DX 3000D, the combination of it's high stability and high accuracy 40 MHz TCXO (± 0.5ppm, -10 °C ~ +60 °C), and it's DDS create the fundamental frequency of this radio, and is locked to the PLL-IC and VCO directly. This circuit construction and method creates the highest quality local signal, with superior S/N performance. This means the receiver noise floor is kept lower, and realizes the best blocking dynamic range at 2 kHz IP3 performance. The modulation circuit of the FT DX 3000D utilizes the digital variation operational modulation type, which creates ideal high quality transmission audio. This radio has a parametric equalizer that makes possible versatile adjustment of the TX audio quality by aligning the TX band audio spectrum. The parametric equalizer can alter the Low, Mid and High part of the audio separately. This three stage parametric equalizer can generate high quality TX audio sound because it can be tuned in detail…without sacrificing the audio dignity. The "RX Output" connector on the FT DX 3000D Rear Panel accesses the signal from the receiver RF amplifier. The signal can then be output to an external receiver for in-band simultaneous receiving. The u-Tuning Kit that was developed for the FT DX 9000, is optionally available for use with the FT DX 3000D. No other Amateur Radio radio manufacturer offers a comparable device that may improve your DXing performance in some challenging operating situations.